You’re thinking about selling your property in Thailand and want it to sell quickly, right? Homes that languish on the market make potential buyers nervous, so your goal should be to get your Hua Hin property ready for sale by making it super attractive to your clients. We’ll provide a few suggestions below to get you started in the right direction! 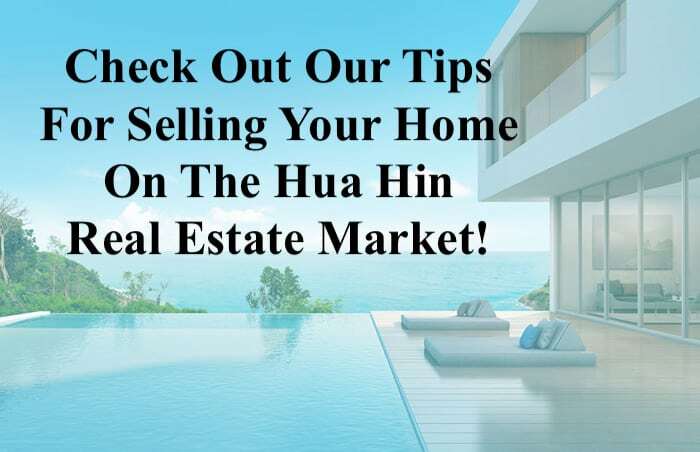 “How To Prepare Your Hua Hin House For Sale” is a two-part series of articles that will give you some good ideas on where to begin. Next week, we’ll talk about staging your home and preparing your property documents. Am I a motivated Seller? Is my home ready for the sale market, and if not, how do I get it ready? How do I stage my property for marketing photographs and client viewings, and what should I do during showings with potential buyers? Are ALL my property documents in order and ready to hand over when a sale offer is made on my home? As long time, active real estate agents working in the Hua Hin property market, we have participated in a lot of sales. We have seen some Hua Hin homes sell really quickly—within a few days or weeks of being listed—and conversely, have also seen some homes sit on the market for far too long with no interested buyers. Why do some houses sell quickly while others don’t? There are a myriad of reasons why certain homes don’t sell, but the most common reasons are an unrealistic asking price, poor condition of the house, and not having all property documents in order. Let’s not spend too much time focusing on why certain houses don’t sell. Instead, let’s concentrate on what you can do to help your home sell quickly and for the best achievable asking price. What does it mean to be a motivated seller? Do you need to sell your house at a super low, rock-bottom price? Not necessarily: price isn’t everything, so just because you’re offering your property at a lower price relative to other homes in the area, it doesn’t necessarily mean you’re a motivated seller. 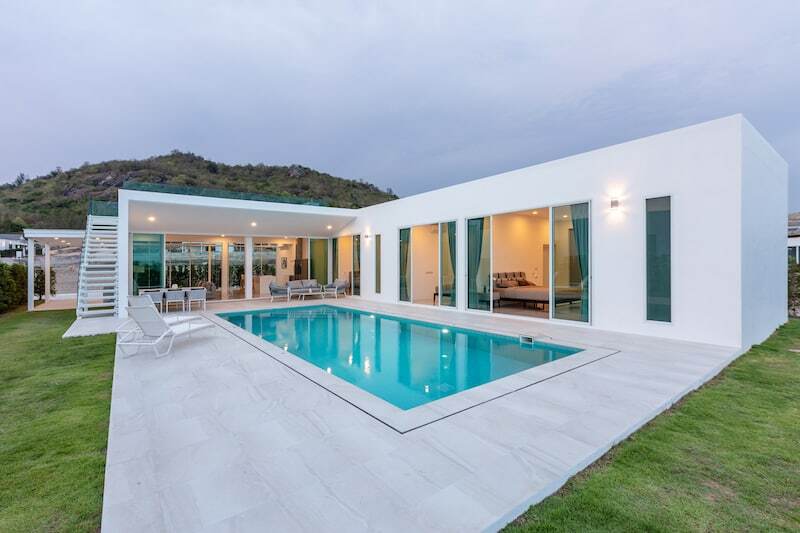 If you want to achieve a successful sale of your Hua Hin property, you first need to be mentally prepared for a sale and willing to put in the work it takes to get your house sale-ready. This means doing everything in your power to prepare the property for the sale market, and one of the first tasks is to do some local research to find out what a fair and reasonable asking price should be for your property. Ask your real estate agents for their opinions, as they are viewing homes every day and should know what properties are actually selling for. You should also be actively advertising your house through multiple marketing channels and encouraging all agents to bring their clients to your home. Most home buyers today do extensive research to find the best property that suits their needs. A motivated seller will understand that the competition for re-sale homes is quite fierce in Hua Hin. It will often be difficult for a typical seller to beat a developer’s prices for a new, off-plan home. With the influx of Chinese buyers who largely prefer brand-new homes, it will become even harder to compete against developers offering properties with ever-increasing access to better building materials and integrated smart home systems. A motivated seller of a re-sale home needs to offer something unique in order to be competitive and stand out from the thousands of other homes on the market. Some simple things you can do to make your home stand out will be discussed below. 2. Is my home ready to list on the real estate market? Too often we agents view a new listing and are surprised at the condition of the property. Maybe the kitchen or master bathroom is in a very poor condition, and the seller explains to us that he/she is decreasing the price in order to account for the necessary repairs or remodel work needed. Or, another one we’ve heard a lot is, “we don’t want to put in a kitchen/bathroom/terrace/swimming pool that the next buyer doesn’t like, so rather than waste the materials and money, we’ll let the buyer choose what he/she likes”. Sorry, but in our experience, the average buyer doesn’t have the imagination to see the finished product, or the buyer doesn’t want to have the headaches of moving into a home and immediately beginning a huge remodel project. The best thing you can do to improve your chances of selling your property quickly is to take an objective look at your home and understand what needs to be fixed, changed, repaired, etc before listing it on the market. If you genuinely can’t see what needs to be done, ask a professional to come out and give you some advice. 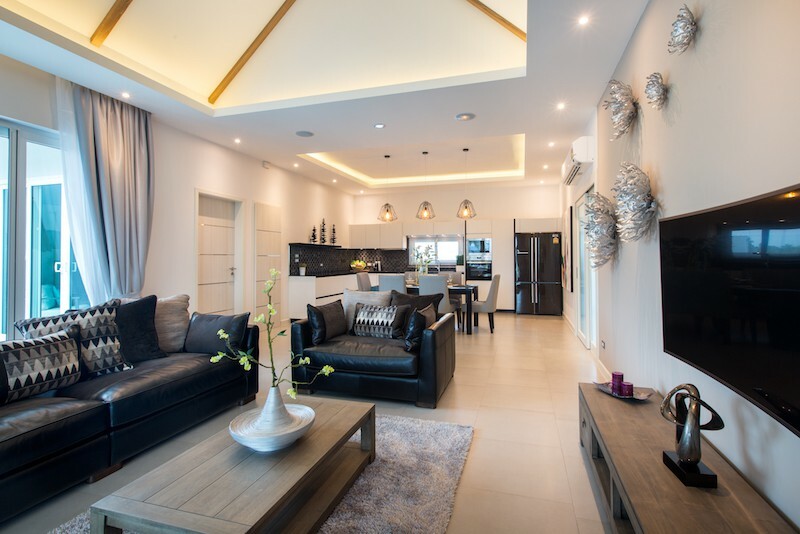 We know that it can sometimes be hard to step back and see a space objectively, especially if you’ve been living in the same Hua Hin property for a long time. Electrical wiring: this is so important and so often overlooked by sellers. You are competing with developers who have access to the most current materials on the market, and if your wiring is old and all your fixtures are old and in bad condition, upgrade now, it will make a huge difference. If you’re looking for a cost effective way to gain a competitive edge over other home sellers, consider upgrading your lights to smart LED lights. Check out Mi-Light (www.milight.co.th) in Hua Hin for options on dimmable smart LED lights that can be controlled from your iPhone or your Alexa personal home assistant! Mi-Light LEDs have a lifespan of 50,000 hours. Potential buyers are smart and can usually tell the difference between good and bad quality. Why would anyone have inefficient halogen lights (typical halogen lifespan 500 – 1000 hours) or ugly fluorescent bulbs in their home when LEDs are available and cost-effective? Also make sure that all the bulbs in the house are working, as blown light bulbs give a bad impression. Check all appliances in the house, as well as all AC units, and repair anything that’s not working properly. Serious buyers will check everything, and attention to detail is key when preparing your home for sale. Plumbing: the same rule for electricity work applies for plumbing. Check to make sure there are no leaks under sinks, in the walls, etc. Also check that all the plumbing fixtures are in good condition—clean any faucets or shower heads that have rust or calcium build-up or replace ones that can’t be cleaned. Again, the small details will draw potential buyers’ eyes. A fresh paint job: this is a fairly easy and relatively inexpensive way to immediately freshen up your property. We recommend a fresh coat of paint both inside and outside, including the perimeter walls. Don’t forget the gutters, the ceilings and possibly also the roof tiles (depending on how old the house is). When choosing paint colors, neutrals are usually your best bet. You can experiment with some bold colors, but keep it limited to one feature wall or a small area. Garden and pool care: we are in a tropical climate, and one of the main attractions to potential buyers is the outdoor living areas. The garden and pool can be just as important to some buyers as the rest of the house. Make sure the garden looks amazing and that the pool is clean and that all the equipment is working properly. If you have a brown thumb and/or zero interest in gardening, hire a professional to give your garden a facelift, and then use your regular gardeners to maintain the grounds. This doesn’t need to be expensive or grand in scale; a clean and tidy garden with some color and beautiful features is usually enough to impress prospective buyers. Make sure all of the above items are in good condition before asking an agent to come and list your property. When the agent comes to meet you, view your home and take photographs, be sure to point out all the work you have recently done to the house. Or even better, prepare a basic document with all the crucial details about your property: land size, living area size, asking price, ownership structure, communal fees, and all the key features and selling points of your home (Need some help? We’ve already made one for you. Check it out here: http://siamsociety.com/downloadable-hua-hin-listing-sale-checklist/). It is so important that all agents are advertising the same information about your property on their various websites. It does no one any good if there is inconsistent information about your home floating around the internet, whether it’s different pricing, different land sizes, etc. Consistency is key, as this will set the stage for whether potential buyers see your home represented in a professional and reliable light. This is it for the first segment of this article. Congratulations, you are well on your way to preparing your property for the Hua Hin sale market. In the next segment we will discuss how to stage your property for photographs and for potential viewings, especially what to do (and not to do!) during client showings. Stay tuned!! If you want to list your house for sale with us or need contractor recommendations, please don’t hesitate to call us anytime: 085-264-2158.